Animals on their own cannot take up spiritual service. They can take advantage of spiritual service created by human beings. They can take prasadam that is left over. 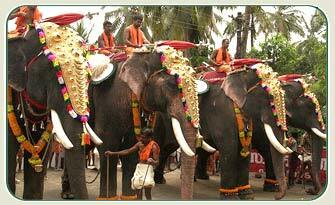 Elephants can carry deities and in this way by human connection they can take up devotional service. But human beings can actually take the initiative to have the freedom to choose. For animals, it is said that they are not responsible for their actions and can do what they like. Animals kill and do so many things, but for them no karma applies. But the animal is going through the karmic reactions of previous life, since they suffer from karma, but it is from previous life, as they don’t create karma from any of their actions. Never Stop Doing Devotional Service.